January | 2015 | Let their light shine! 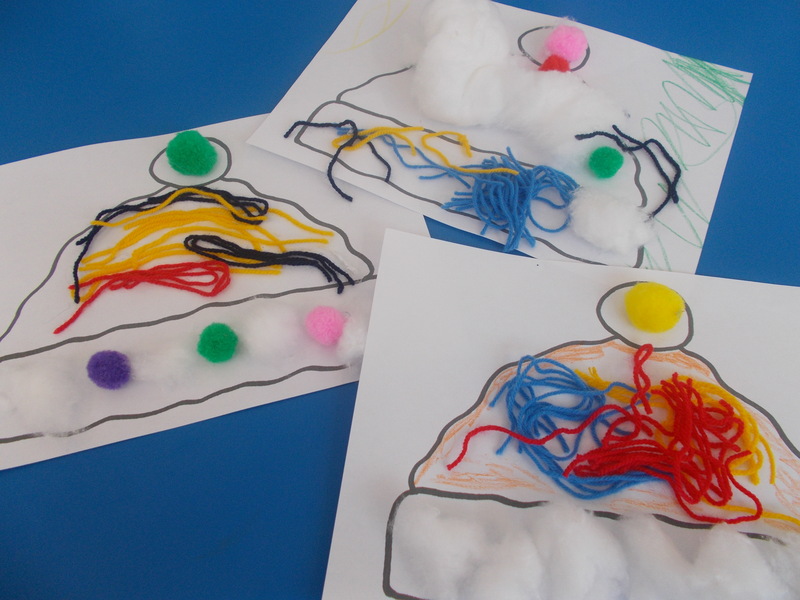 It’s been cold and wintry so we made a bobble hat collage. We had mittens too but I have no photos. I just wasn’t quick enough. 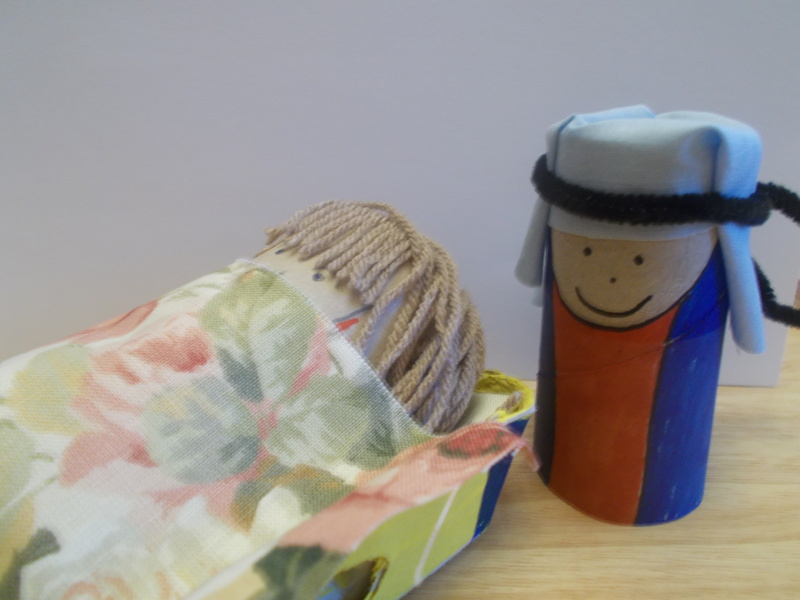 The bed is made from an egg box and the people from cardboard rolls. 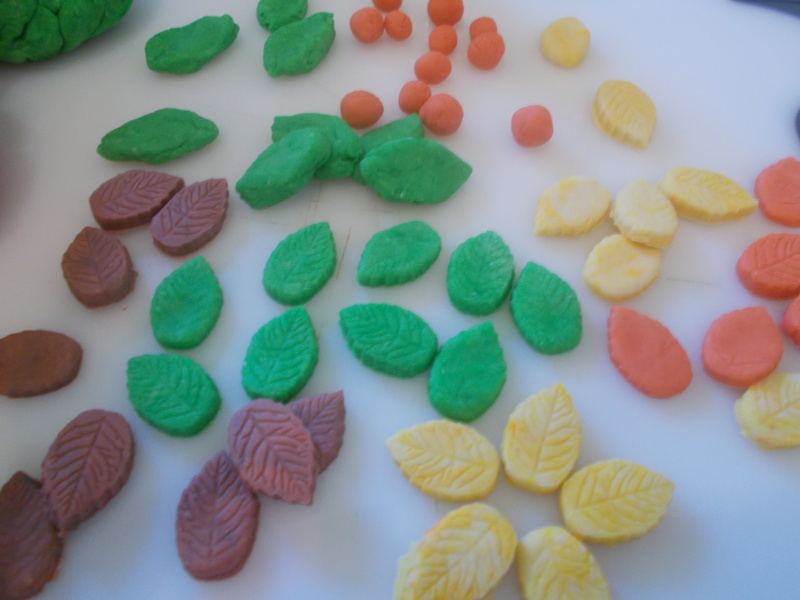 I love playdough, especially the homemade variety. 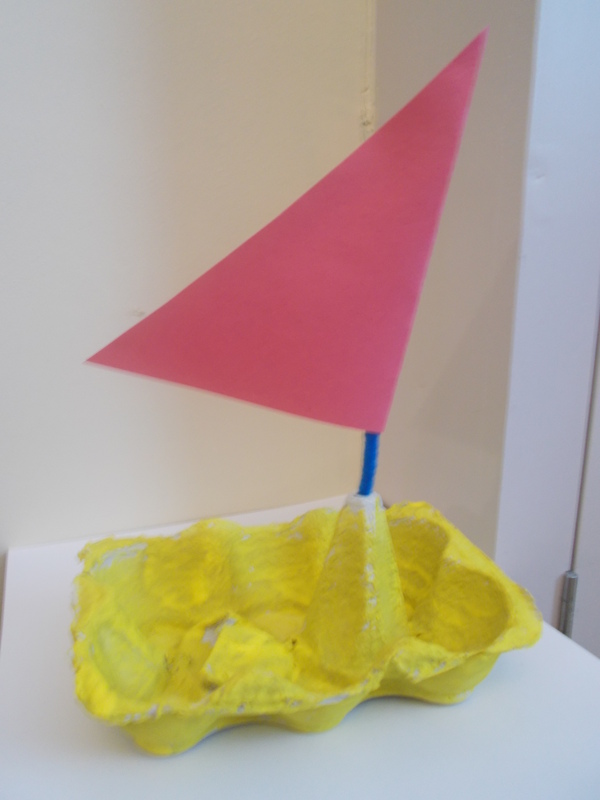 It’s relatively cheap and lasts a long time and gives hours of fun and creativity. 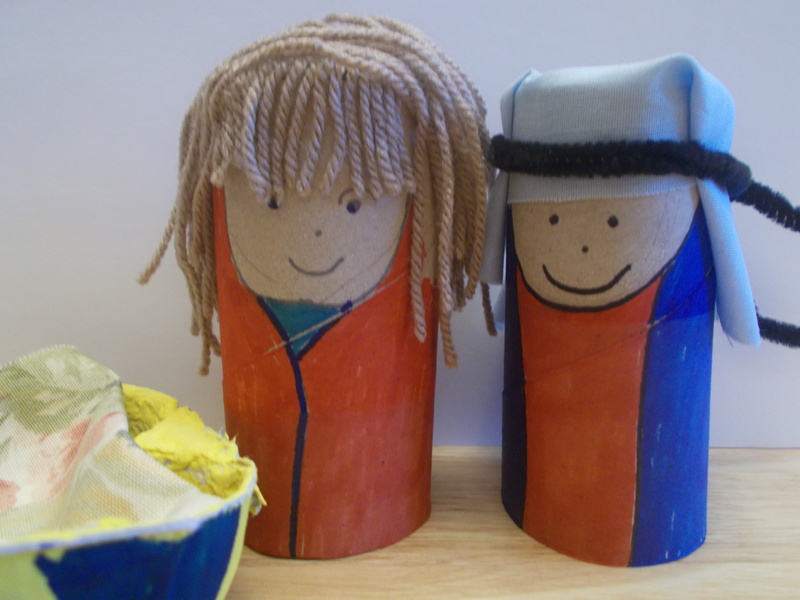 You can make characters from Bible stories with it, add it to laminated print outs, make shapes – anything. 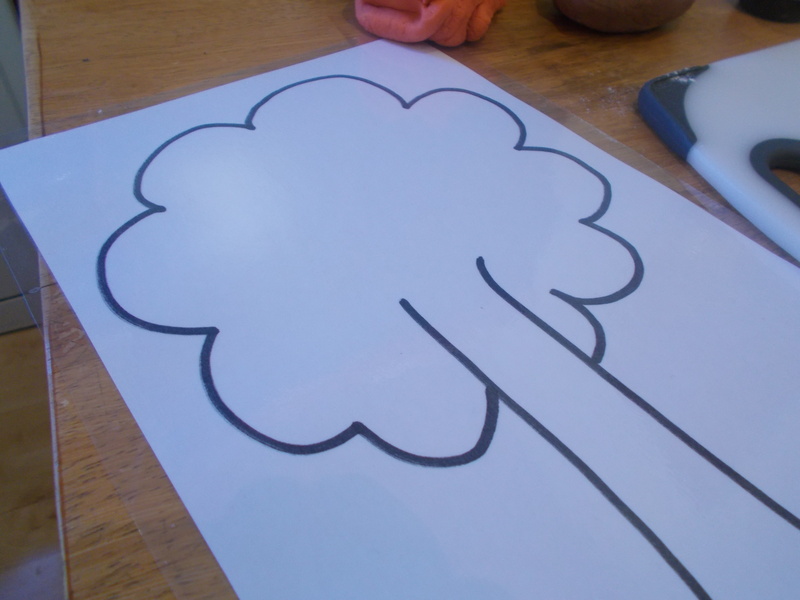 It’s great for young children to practice their fine motor skills and exercise their hand muscles ready for writing and drawing. 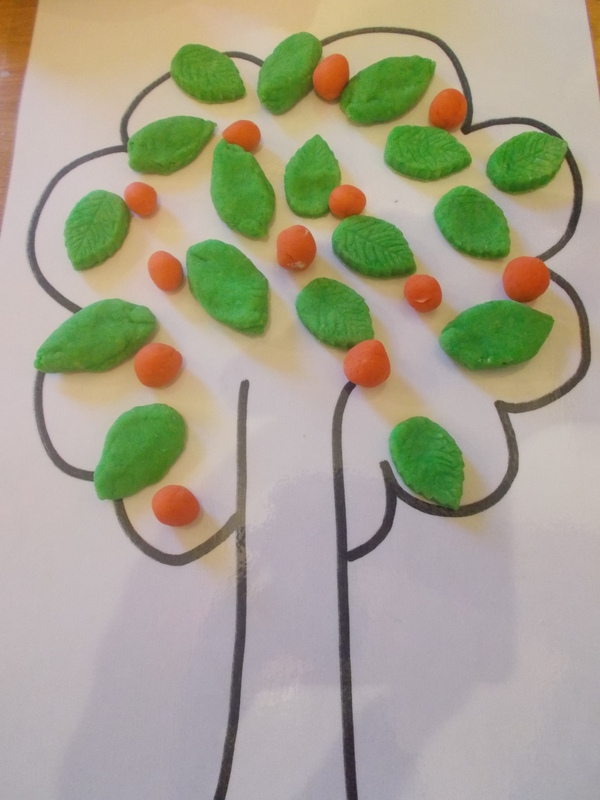 It’s also good for keeping children focused on a sustained activity – they often willingly concentrate on playdough for quite a while. 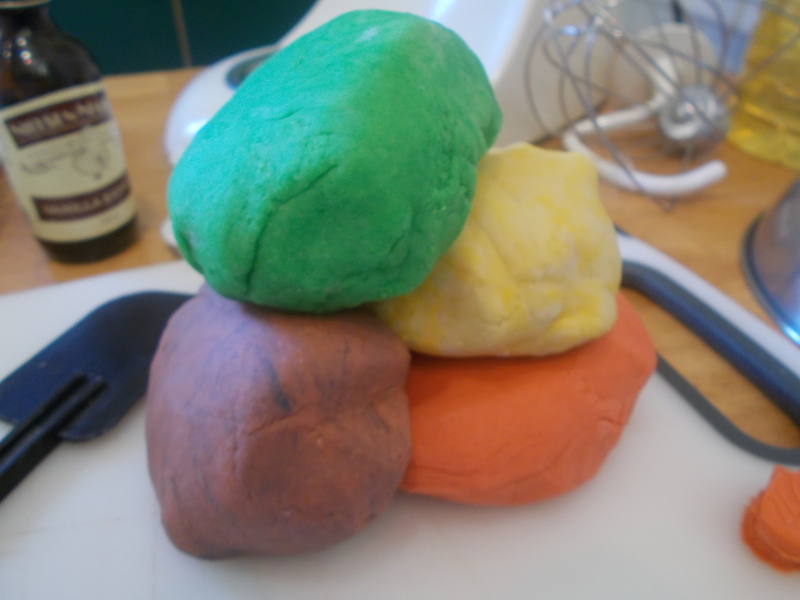 The above playdough is a no cook recipe – it uses boiling water so has to be made by an adult. 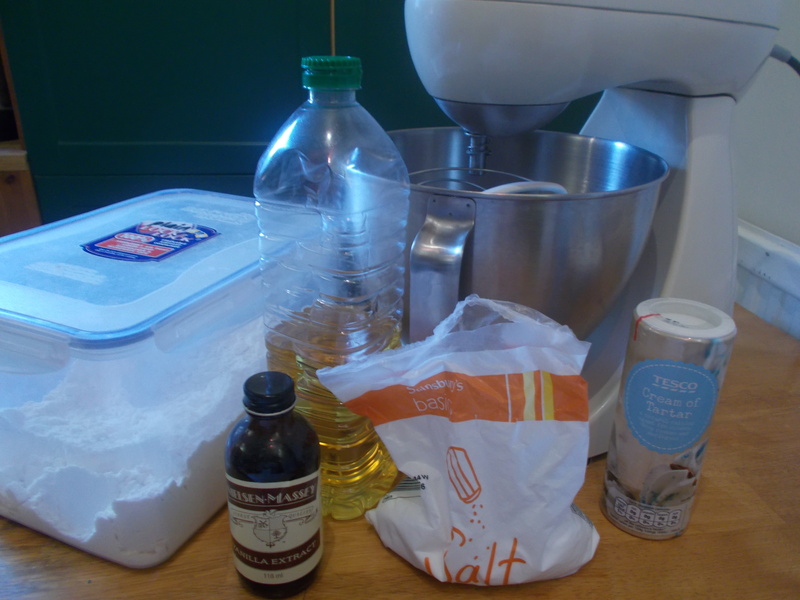 To make add all the dry ingredients to a mixer and then add the oil, boiling water and colouring and mix till a soft dough. I tripled this amount to make the different colours in the picture. I added some vanilla extract but I’m not sure it’s worth it – I think you would have to add a lot to really notice a vanilla scent and that would be quite expensive. 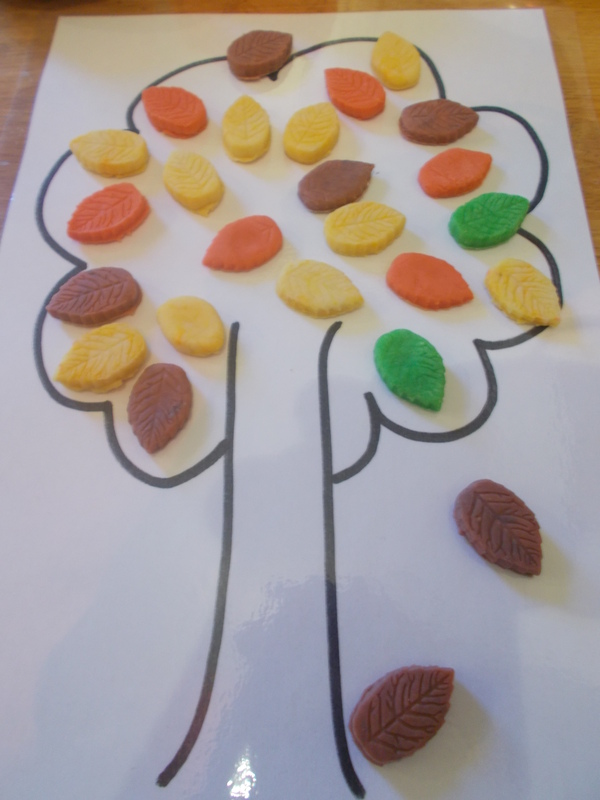 I had a play with the dough – a simple tree laminated – here’s a free tree PDF Tree I made an autumnal tree and an apple tree. Just a few more days to enter our giveway! 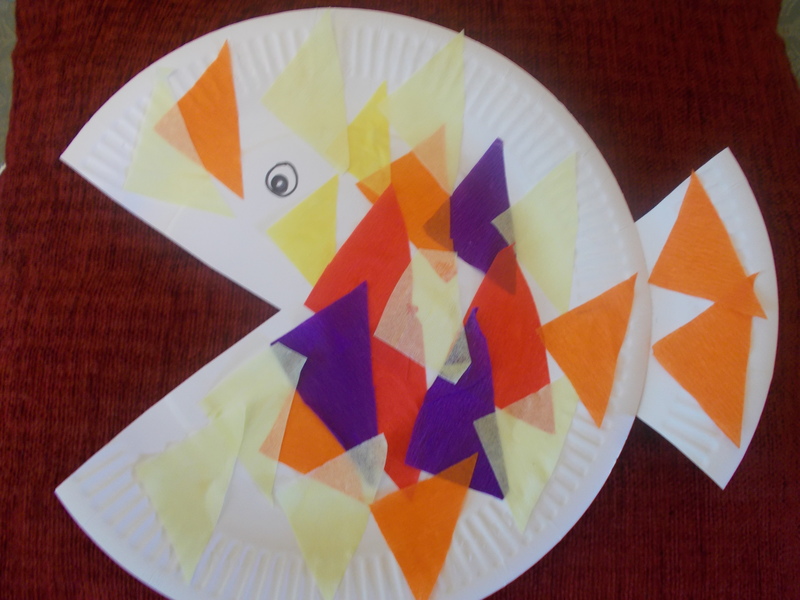 Our craft from toddler group yesterday – fish paper plates with shiney paper and tissue paper and paint. Bible stories that you could use this with – calling of the first disciples (Mark 1), The great catch of fish (John 21), Calling of Simon Peter (Luke 5). 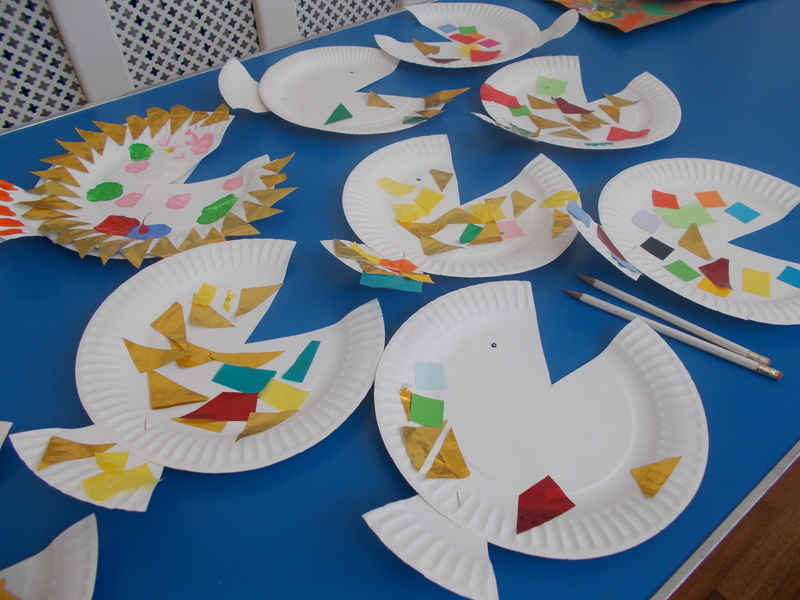 The children (and adults) did some very creative work! 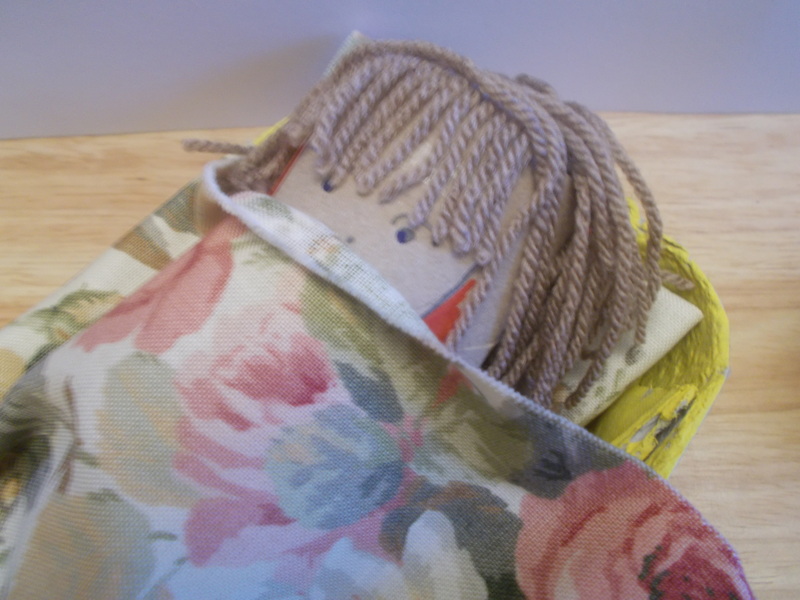 Six day left to enter the giveaway! 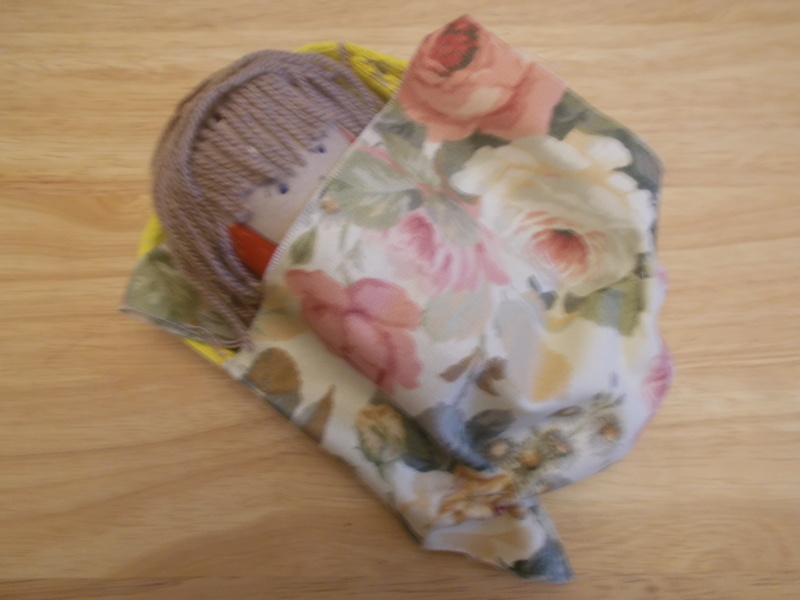 A few months ago I won a giveaway on a blog. It was a lovely surprise. So I’ve decided to do a giveaway of my own. 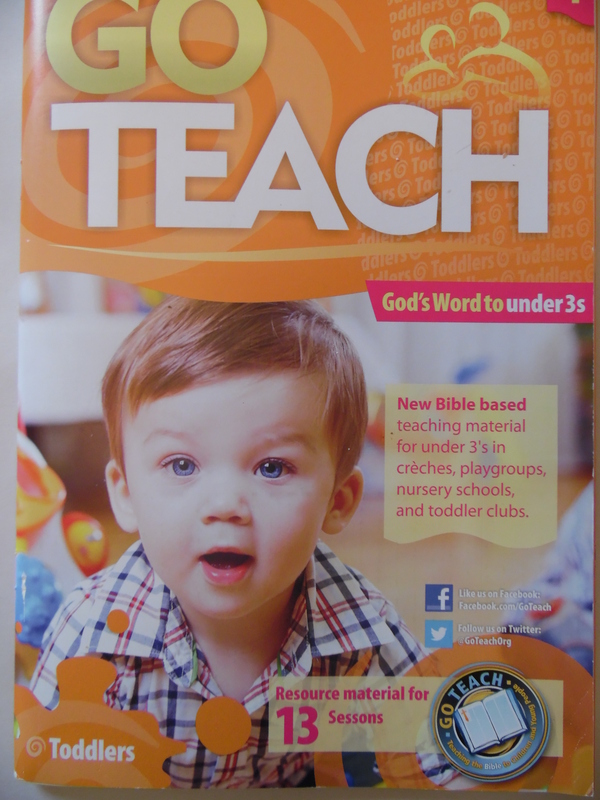 It will be a copy of the Toddler Group Bible Storytime Book and a few nice surprises. We will post anywhere in the world! 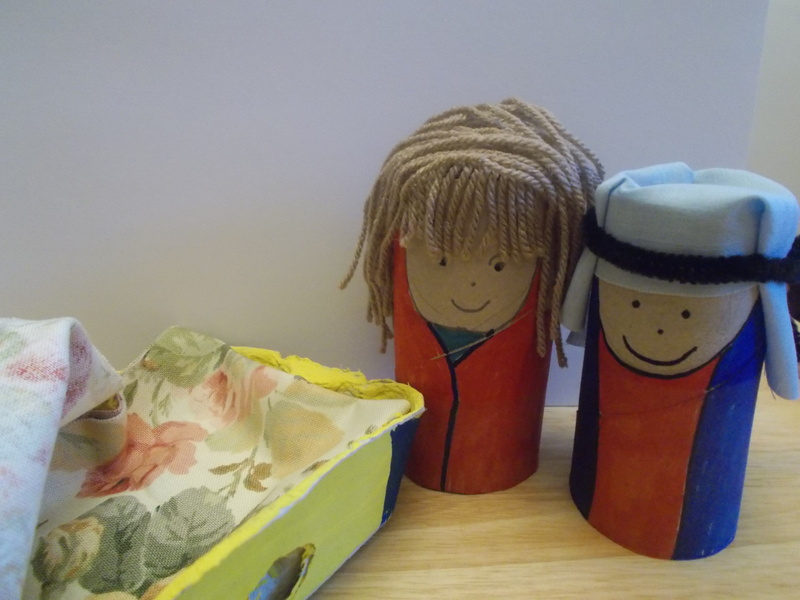 The book has stories and craft and play ideas for under three’s. Oh, and you have till Jan 31 2015 to enter. The winner will recieve a message and be asked to provide a current address after 31 Jan 2015. Please don’t put your address in the comments. 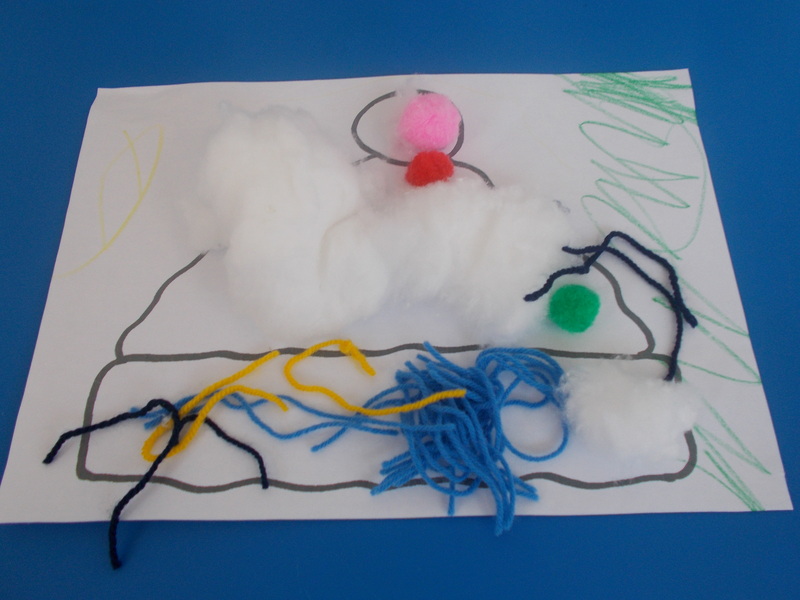 Last week at toddler group we told the story about the Baptism of Jesus. 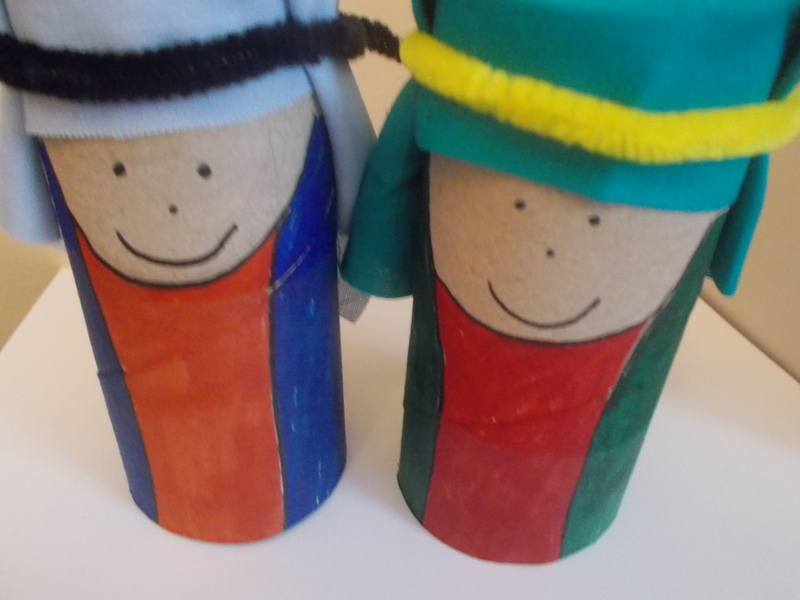 This week we move on to the calling of Simon and Andrew to follow Jesus. 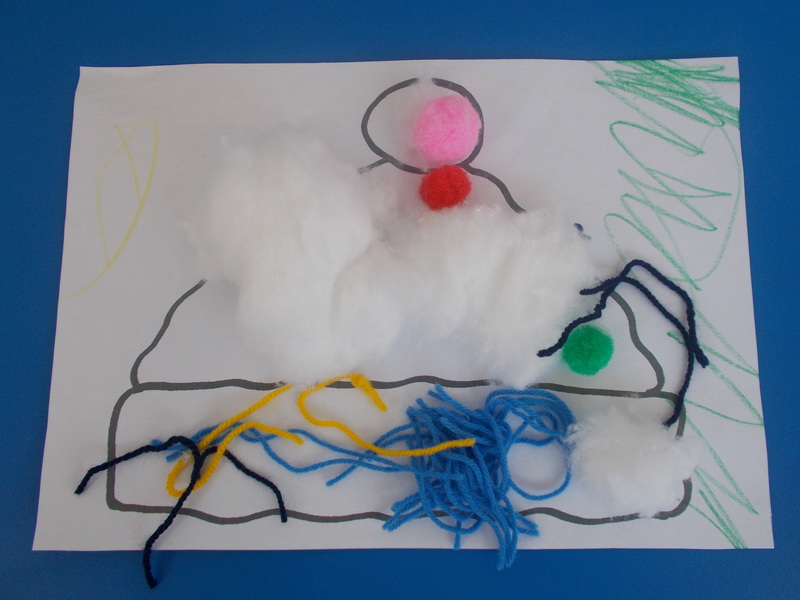 To help the children picture what is happening in the story I have made a boat and two disciples using an egg box and cardboard rolls. The story will be very short and will be told from Mark 1:16-18. 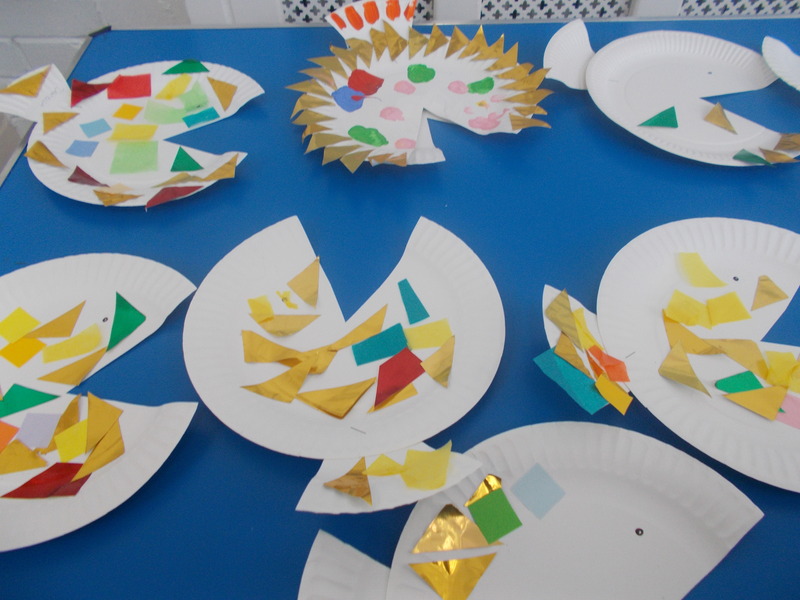 The pictures should give a clear idea of how everything was made! 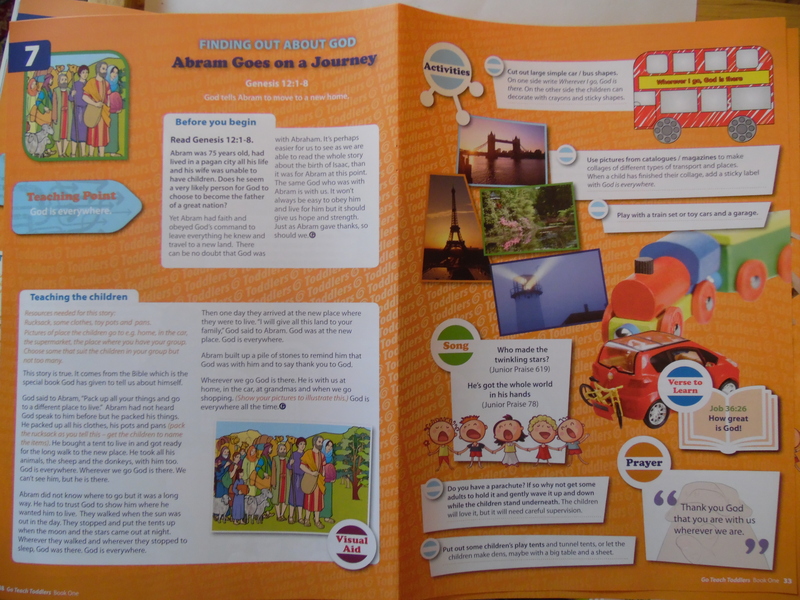 A fun way of making rules for Children’s church! Take a look at thie You Tube Clip for a different way of sharing a set of rules. It’s fun! I may have to try and make my own version. 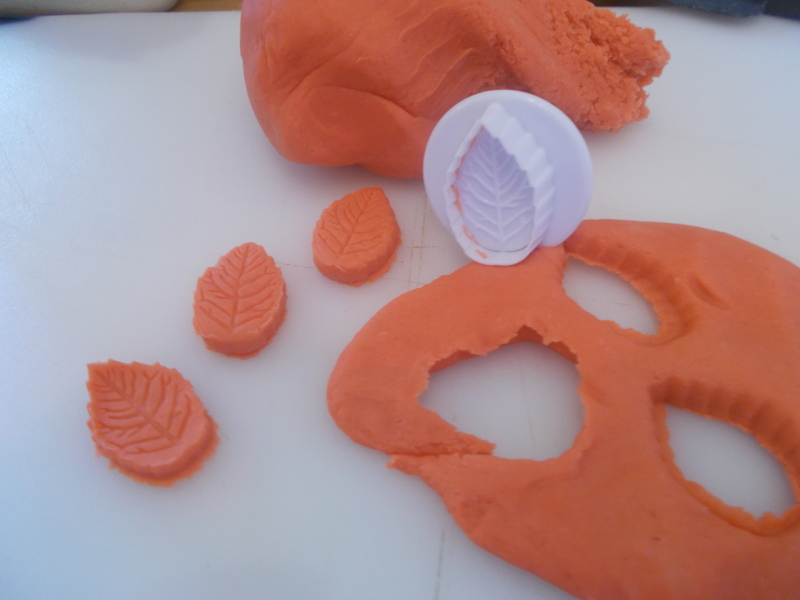 This playdough is a no cook recipe – it uses boiling water so has to be made by an adult. Recipe 1 cup flour 1/4 cup salt 1 teaspoon cream of tarter 1 tablespoon vegetable oil (don’t use a nut oil in case children are allergic) 3/4 cup boiling water Food colouring paste or ready mix water colour paint for colour To make add all the dry ingredients to a mixer and then add the oil, boiling water and colouring and mix till a soft dough. 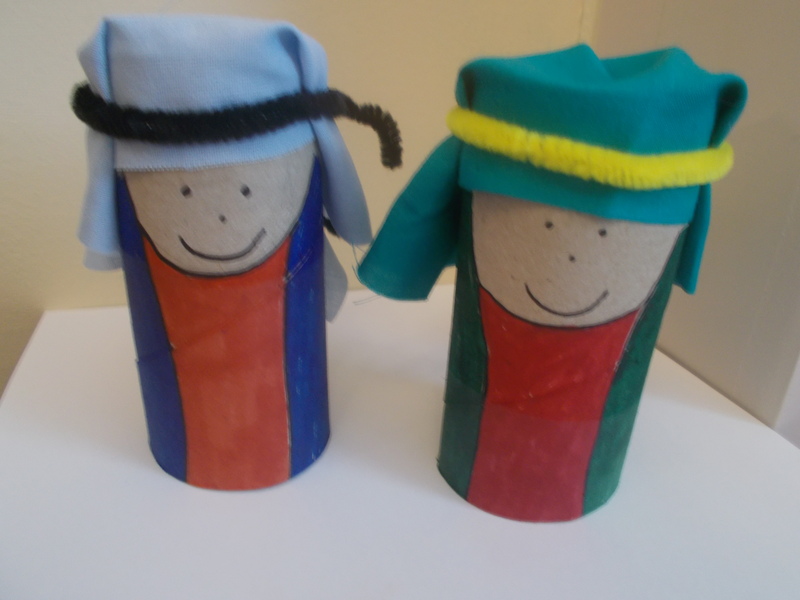 Actions for storytelling Advent advent calendar 2015 All age craft Animals Bible Alphabet Bible storytelling Book review Christmas Christmas baking Christmas craft Christmas story Cooking with kids Craft Creation Easter Easter with toddlers Family craft idea Family Ideas Genesis 1 Holiday Bible Club Journey to Bethlehem Memory verse ideas New Testament Bible Stories Old Testament Bible stories Paper plate craft Pdf file Printable Props for storytelling Seasons Toddler craft Toddler Group Toddlers - our senses Toddlers - we are wonderfully made Uncategorized What is God like?